In 1796 Beethoven, at twenty-five years old, was an active concert pianist and as part of his Berlin tour he was invited to the royal palace by the king of Prussia, Friedrich Wilhelm II, a keen cellist and music lover. Haydn and Mozart had both dedicated string quartets with prominent cello parts to the king but Beethoven dared to go one better – he delivered the opus 5 cello sonatas nos. 1 and 2. Beethoven premiered them at the palace with cellist Jean-Louis Duport, the younger of the two Duport brothers. The Duports were breaking new ground in cello technique and are credited with the invention of the cello spike which stabilises the instrument allowing for more virtuosic playing. It is clear that Beethoven sought advice as well as inspiration from the Duports as many of the virtuosic passages in his sonatas bear significant resemblance to the Duport etudes, which are still studied by cellists today. The only previous examples of sonatas for keyboard and cello are those by Luigi Boccherini, yet these were simply for cello with continuo harpsichord accompaniment. Other lesser-known composers had written sonatas for the combination, but these are really piano sonatas with a practically superfluous cello part. Beethoven was the first to write a truly democratic work for cello and piano, with the instruments as equal partners. Cellos in Beethoven’s day had gut strings which make a softer sound than their modern steel counterparts and did not have the advantage of a high range like the violin. Part of Beethoven’s challenge in writing these works was to balance the cello with the piano which was advancing in sound and size all the time. …and then launches joyfully into the Allegro theme we know so well for the end. The F major sonata is in two movements unlike the piano and violin sonatas from the same period which are in three or four movements. It is however on a grand scale, in keeping with the royal prestige of its dedicatee. The second movement is an exciting spectacle overflowing with virtuosic outbursts from both instruments. The boisterous energy is sustained almost all the way through with the occasional wistful lull where the cello holds long notes and the piano tinkles gently. For the most part, however, Beethoven’s music is not polite and would have been shocking to an audience used to the grace and elegance of Haydn and Mozart. He makes use of the earthiest sounds a cello can make with loud scrubbing effects deep in the register. 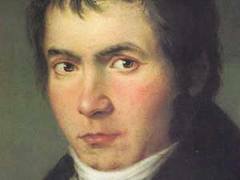 Near the end of the piece, Beethoven slows down almost to a standstill and then jolts his audience out of that trance with a cascade of brilliance and grand heroic ending. Beethoven’s genius is such that he simultaneously achieves a superb exploration of the capabilities of the cello, a fantastic display of his own extraordinary keyboard skills and all within a wonderful example of his mastery as a composer. Thus Beethoven introduces himself to King Wilhelm II, but more importantly he introduces a new genre, the sonata for piano and cello.